PEARL HARBOR - The amphibious transport dock ship USS Portland (LPD 27) arrived in Pearl Harbor, May 29, to conduct Combat Systems Ship Qualification Trials and prepare for a unique role in exercise Rim of the Pacific. The ship departed San Diego May 21 and began her transit to Hawaii. The ship's crew has engaged in various training exercises within the past couple of weeks to ensure the ship's weapon systems are properly installed, function correctly, and can be operated safely. Portland performed her first underway replenishment (UNREP), employing the Standard Tensioned Replenishment Alongside Method, May 22. Steaming approximately 200 feet alongside the lead ship of her class, Military Sealift Command fleet replenishment oiler USNS Henry J. Kaiser (T-AO 187), Portland received more than 175,000 gallons of marine diesel fuel and JP-5 jet fuel from the oiler. "UNREP was well executed by the crew," said Lt. David Youker, Portland's operations officer. "We were able to assess material condition and watchstander readiness, while increasing our operational capability." In addition to the UNREP, Portland performed deck landing qualifications with three MV-22B Ospreys from Marine Medium Tiltrotor Squadrons 163, 165 and 363, as well as one CH-53E Super Stallion from Marine Heavy Helicopter Squadron 465. These flight operations marked a few firsts for Portland-it was the ship's first night landing operation with an Osprey and the ship's first time conducting flight operations with a CH-53. This is the largest number of aircraft in the ship's airspace to date. For the first time since RIMPAC 2002, U.S. 3rd Fleet's Command Center will relocate from San Diego to Pearl Harbor to support command and control of all 3rd Fleet forces in 3rd Fleet's area of responsibility to include forces operating in the Western Pacific. The Fleet Command Center will be established at a Deployable Joint Command and Control on Hospital Point in Hawaii for the first part of the exercise and then transition to Portland for the remainder of the exercise. "It will be a unique experience for the crew to be a part of the relocation of 3rd Fleet's command center," said Capt. J. R. Hill, Portland's commanding officer. "This is something that has not happened in a while and USS Portland is proud to be able support the mission." During Portland's time in Hawaii, the ship will host Commander, U.S. 3rd Fleet, Vice Adm. John D. Alexander and his staff, participate in community service projects, experience Hawaiian culture and make preparations for the underway training events. U.S. 3rd Fleet provides the realistic, relevant training necessary for an effective global Navy and leads naval forces throughout the Pacific theater of operations in coordination with U.S. 7th Fleet to promote ongoing peace, security and stability. 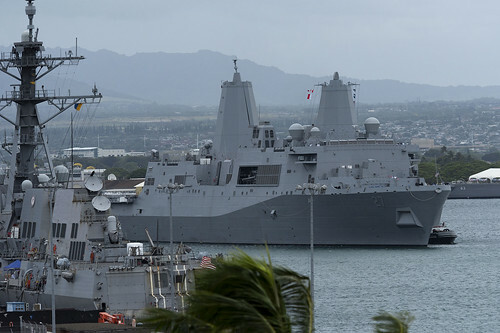 Portland is the 11th San Antonio-class amphibious transport dock ship. While it is the third ship to bear the name 'USS Portland,' it is the first ship to be named solely after the largest city in Oregon.